The room 4 of the Uffizi Gallery is dedicated to the Fourteenth century in Florence. In this space there are works of religious themes, painted by Florentine masters. They were heirs - in different ways - of Giotto\'s art. In the room there are some large polyptychs, unfortunately incomplete or deprived of their original frames. In addition, there are some small paintings, which were used for household devotion. Let\'s discover some of the most important works in the room. Here we can admire the Saint Matthews and stories of his life by Andrea di Cione, known as Orcagna (ca 1308 - 1368). The altarpiece was made to cover one of the pillars in the church of Orsanmichele. The work was commissioned by the Arte del Cambio, a guild of Florence. We can also admire the Santa Cecilia and episodes of her life by the artist known as the Master of Santa Cecilia. Probably he was a collaborator of Giotto. He takes his own nickname from the work shown here. The Pietà di San Remigio - considered one of the Fourteenth century Florentine masterpieces - was painted by Giottino (ca 1324 - ca 1357). His style reveals several innovations, both in the line and in the use of color. 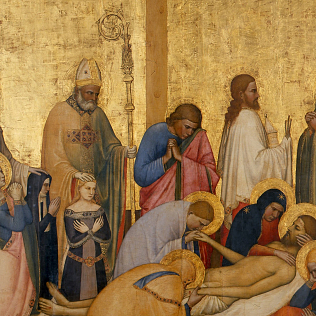 The Ognissanti Altarpiece was painted by Giovanni da Milano (1325 ca - 1370 ca). He is not a painter in Florence, but he is exposed in this room. He often worked in the Tuscan city and had the Florentine citizenship. Along with Giottino he is considered an important innovator of the Florence painting school. In the room there are also works by Bernardo Daddi, Taddeo Gaddi, Nardo di Cione, Jacopo del Casentino, Pacino di Buonaguida.